When I flew earlier this week I was one of the 15 Business Select Passengers on my flight–ooo la la. Getting to be at the front of the boarding line for "cattle-call" air is always nice; I appreciate the opportunity to pop my bag into the overhead bin before the general pushing and shoving begins and of course I was thrilled to grab something other than that middle seat. But we all know the big beni is the free cocktail coupon. My instinct has always been "go for the hard stuff"–Finlandia is Finlandia, right, and Bacardi is Bacardi… a win-win on all accounts. But, I thought it'd be fun to expand my wine palate and give that tiny 187ml bottle of Coastal Ridge Merlot a try. I know what Miles said in Sideways, but I actually like Merlot, and I have had a few experiences with drinkable inexpensive examples. Inexpensive, from my perspective, being maybe $8-10 for a 750ml bottle. The 2011 vintage was pretty aromatic; I could smell it from the tray in the aisle. Strangely, it had an overwhelming aroma of Pinot or an Australian Shiraz, so much so, I went back to the galley later to take a peak at the bottle. I was hard pressed to believe it was Merlot, as it was unlike any I'd ever had. 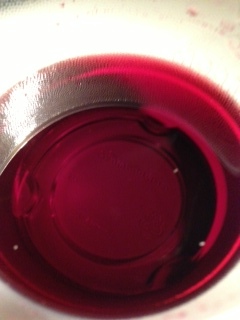 It was a light-bodied, translucent wine, the color of berry juice and had peppery acidity and lackluster tannins. I perceived a bit of cherry and vanilla at the finish, which in itself was relatively nonexistent; the wine couldn't wait to be done doing it's thing in my mouth. It reminded me of a really inexpensive French negociant wine that you might pick up for $4 at Trader Joes. That's about all I can say about the wine itself. Before I write my reviews, I research specs online (I always do this after I'm done tasting and note taking). During my research, I quickly tune into the three clues that indicate I'm likely dealing with a mass produced, bulk wine. Firstly, I have a very difficult time tracking down winery information for these wines. When I do find my first reference, it is usually on a distributor's website, contained within a list of numerous producers of California wine, none of whom most of us have ever heard of. Half of the time, the website links for info don't even work and I've yet to actually find an address for any of these wineries. I'm sure if I used the services of a forensic computer techy, I could locate one. Secondly, these types of wine will often have an impressive place name for the winery (e.g., Napa Valley) on the distributor trade sheets. As a consumer, it is important to know that doesn't mean you are drinking a wine made from grapes grown in the Napa Valley. A wine labelled Coastal Ridge Napa Valley California Merlot can mean you are drinking a wine where previously purchased juice is simply blended and bottled in some nondescript warehouse somewhere within the geographic boundaries of Napa Valley. Think industrialized wine factory–not bucolic family vineyard. These wines also often have "California" listed as their appellation. Here is why it is helpful to have a general understanding of wine labelling laws–when the appellation name "California" shows up on a bottle, the grapes, by law, can be grown anywhere in the state and thrown together to make wine. You can bet, the overwheming majority come from the non-AVA delineated Central Valley of California, where little attempt is made to farm grapes for sophisticated wines–at least for the bulk market. Last clue: after lengthy attempts to sleuth things out, my online searches will often yield one or two veiled references to small agriculural towns in the Valley. This time I spotted Ceres, located just outside of Modesto. My guess is some or all of the grapes were sourced from around there–just as I had suspected. One last tidbit on label laws. Remember, a varietally labelled wine (e.g., Merlot) only needs to contain 75% of that grape. In this instance, the wine contains 76% Merlot, 4% Segalin and 20% Proprietary Blend. I was intrigued by Segalin, which I'd never heard of and found out that it is a cross between two red grape varieties used in the southwest of France. Their use adds structure and color to single varietal wines. As for the "Proprietary Blend", I'll need to delve deeper into labelling laws, because I'm curious how they get away with that. 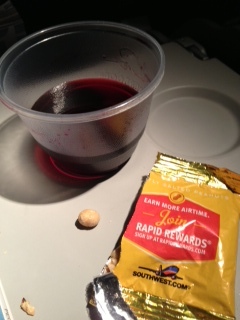 Regardless, it makes me think there is some Pinot Noir or Syrah, based on the aromas I perceived on the plane. and Dotty's Casino in Sparks NV. Petit Verdot–A Perfect Little French Varietal–And Why I Like It!